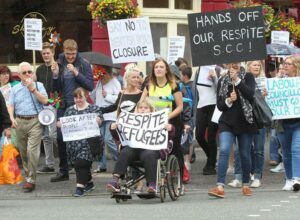 The unions have branded as “callous and shoddy” the proposed closure of two council-run residential care homes, the replacement of Sure Start staff by volunteers and the outsourcing of looked-after children’s services. These and other cuts will result in 123 staff losing their jobs. These latest cuts come after eight years of attacks on public services in the city and the loss of over 1,000 jobs. For the last seven of those years the council has been controlled by Labour! Labour councillors should make a stand against these cuts or face being replaced by councillors who will. Encouraged by this new determination of the trade unions, the families of adults with severe learning difficulties are now calling on Unite and Unison to support their on-going campaign to re-open full-time the Kentish Road Respite Centre, an earlier victim of budget cuts. To kick off the campaign, Unite Community Southampton Area is organising a demonstration for 10.00am on Saturday, 3 November, outside the Solent Spark Building on East Park Terrace in Southampton (SO14 0YN), where the Labour Party’s South East Regional Conference will be taking place. Unite Community has urged residents of the city and surrounding area to attend and show their solidarity.